Hiko-nyan, official mascot. More Hikone photos here. Hikone (彦根市; -shi) is a city in northeastern Shiga Prefecture facing Lake Biwa. Hikone's claim to fame is Hikone Castle, with one of five castle towers (tenshu) in Japan designated as a National Treasure. The castle is one of Shiga's major tourist draws and overshadows all other attractions in Hikone which also has a number of noted temples. The castle has very beautiful cherry blossoms all over. One of the best sakura spots in Japan. Hikone Castle celebrated its 410th anniversary in 2017 with exhibitions inside castle buildings from March 18 to Dec. 10, 2017. 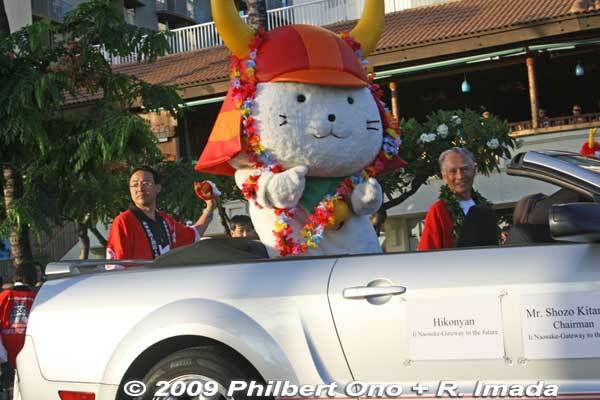 In 2007 when Hikone Castle celebrated its 400th anniversary, they created the nationally popular official mascot named Hiko-nyan which may be more famous and popular than the castle itself. Hikone Castle was founded in 1607 by Lord Ii Naomasa 井伊直政 who was awarded the domain of Omi (Shiga's feudal name) by Tokugawa Ieyasu after they won the Battle of Sekigahara in 1600. Three castle buildings (Umaya horse stable, Tenbin Yagura turret, and Nishinomaru Sanju-yagura turret) are open to the public. It took 20 years to construct the castle, completed by Lord Ii Naotaka 井伊直孝, the second castle lord. Hikone Castle was also the base for Lord Ii Naosuke (1815-1860) 井伊 直弼 who was a high-ranking official (Tairo) in the Tokugawa government and who agreed to open up Japan upon the beckoning of Commodore Mathew Perry in the 19th century. Official diplomatic relations between Japan and America thus started with Shiga native Ii Naosuke and Commodore Perry. Hikone Port also has pleasure boats going to Chikubushima island in neighboring Nagahama. For the Tokyo 2020 Olympics, Hikone will be the host town for Spain's handball team. As part of its preparations, the city plans to hold handball classes for its junior high and high school students. 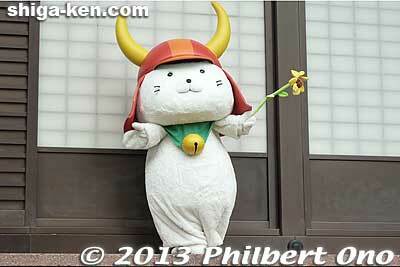 Hiko-nyan ひこにゃん - Hikone's official mascot created for Hikone Castle's 400th anniversary in 2007. Basically a white cat with a horned samurai helmet. Since he proved to be so popular, he was retained as the city's official mascot ever since. Hiko-nyan appears three times daily at Hikone Castle for a 30-min. show: 10:30 am in front of the main castle tower (tenshu) and at 1:30 pm and 3:00 pm outside Hikone Castle Museum. According to legend, one day, Ii Naotaka, the third lord of Hikone Castle, was doing falconry in Tokyo and was near a temple when he saw this cat raising its paw. He was led inside the temple where he was able to rest inside. A major thunderstorm ensued, and the cat saved him from getting wet. Another legend says that as soon as the cat beckoned Naotaka into the temple, lightning struck the tree where he was standing. Thus, the cat saved his life. This legendary cat connection gave birth to the idea behind Hiko-nyan. This same legend is also one theory for the origin of the ubiquitous beckoning cat you see at shops and restaurants in Japan. The beckoning cat can be called Hiko-nyan's cousin. Hikone Castle Moat Boat Ride 彦根城お堀めぐり - From March 2007, the Koedo Hikone NPO started operating "yakata-bune" Japanese-style boats in the moats of Hikone Castle as a tourist attraction for the castle's 400th anniversary. They operate 6 rides per day around the castle, taking 50 min. It certainly gives you a different perspective of the castle as you see the moat, castle tower, and bridges from the water. The ride costs 1,200 yen. Early April - Cherry blossoms at Hikone Castle. One of Shiga's famed spots for sakura. Aug. 1 - Lake Biwa Fireworks on Matsubara Beach. Oct. weekend near the 29th - Little Edo - Hikone Castle Festival. Nov. 3 - Little Edo Hikone Castle Festival Parade 2009 小江戸彦根の城まつりパレード. Afternoon parade of children and adults in historical costumes, especially samurai from the Ii clan. The parade includes demonstrations of matchlock gun firing and fireman's acrobatics. Every day at 10:30 am, 1:30 pm, and 3 pm - 30-min. appearance of Hiko-nyan at Hikone Castle. JR Hikone Station has a tourist info office where you can pick up maps and pamphlets. Hikone Castle and other places of interest are within walking distance from Hikone Station. 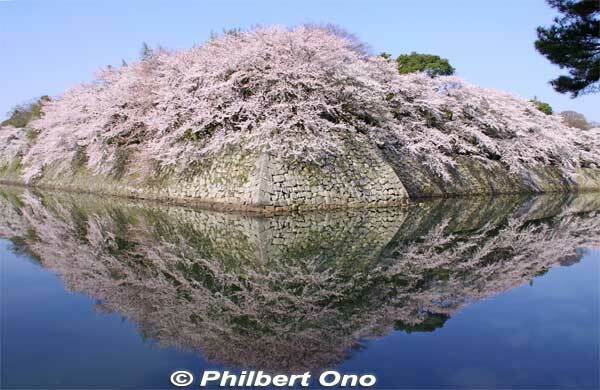 If it is cherry blossom season, try to visit Hikone Castle in the morning. Otherwise the cherry blossoms will be in the afternoon shadow or backlit by the sun. A boat ride in the Hikone Castle moat started operations in March 2007, and it gives a different perspective of the castle. Highly recommended. In Nov. during the autumn foilage, visit Genkyu-en Garden at night to see the fall leaves lit up at night. Hikone Station is the city's main train station and gateway. Two train lines pass through the station. The closest shinkansen station is Maibara Station 5 min. away in neighboring Maibara. All trains (futsu and shin-kaisoku express) stop at Hikone Station. Only the local (futsu) trains stop at Inae Station and Minami-Hikone Station. Being able to ride on Ohmi Railways is also convenient. From JR Tokyo Station to Hikone Station: JR Tokaido Shinkansen to Maibara Station (2.5 hours), then transfer to Biwako Line to Hikone Station (5 min.). From JR Kyoto Station to Hikone Station: About 20 min. via Tokaido Shinkansen to Maibara Station, then 5 min. via Biwako Line to Hikone Station. Or about 50 min. via JR Tokaido/Biwako Line shin-kaisoku express. From JR Osaka Station to Hikone Station: About 75 min. via JR Tokaido/Biwako Line (Shin-kaisoku). From JR Maibara Station to Hikone Station: 5 min. via JR Tokaido/Biwako Line. From JR Nagahama Station to Hikone Station: 15 min. via JR Biwako Line. From Ohmi Railways Yokaichi Station to Hikone Station: 30 min. via Ohmi Railways. From JR Nagoya Station to Hikone Station: Tokaido Shinkansen to Maibara Station (25 min. ), then transfer to Biwako Line (5 min.) to Hikone Station. Or via Tokaido Main Line to Maibara Station (train transfer at Ogaki Station may be required) (1 hr 15 min.). Then transfer to the Biwako Line to Hikone Station (5 min.). Hikone has two rail lines, both passing through Hikone Station: The JR Tokaido Line (also called the Biwako Line) and Ohmi Railways. Both train lines have a few stations within Hikone. On the Biwako Line, all trains stop at Hikone Station. However, only the local (futsu) trains will stop at the smaller stations of Inae, Kawase, and Minami-Hikone. On the Ohmi Railways, all the trains stop at all the stations. Hikone Station (彦根駅) - The city's main station and closest to Hikone Castle, Hikone Port (for Chikubushima), and shrines and temples. Minami-Hikone Station (南彦根駅) - Viva City shopping mall with shops and movie theaters. Kawase Station (河瀬駅) - Residential. Inae Station (稲枝駅) - Residential. Fujitec-mae Station (フジテック前駅) - New station opened in Mar. 2006. Near the factory of Fujitec, maker of elevators and escalators. Toriimoto Station (鳥居本駅) - Toriimoto-juku is a former stage town on the Nakasendo Road. Hikone Station (彦根駅) - Hikone Castle and temples are nearby. Hikone-guchi Station (彦根口駅) - . Takamiya Station (高宮駅) - Transfer point between the Ohmi Railways Main Line and the Taga Line for Taga Taisha Shrine. Screen Station (スクリーン駅) - New station opened on March 15, 2008. Near Dainippon Screen Mfg. Co. Ltd.'s semiconductor R&D center. The station was built by the company for its employees. Local buses leave from Hikone Station to other parts of the city such as Hikone Port. Ask the Tourist Information office at Hikone Station for bus directions. Rental bicycles are available across from Hikone Station on the 1st floor of AL Plaza shopping mall. Rental bicycle shop Megurinko has rental bicycles for about ¥600–¥800 per day. They have high-quality bicycles as well as electric bicycles. Open 9 a.m.–5 p.m.
Click on upper right icon to enlarge. More photos at Hikone Photos. More Shiga photos here. Comprehensive video about Hikone Castle in English. 1600 - At the Battle of Sekigahara, Ishida Mitsunari, lord of Sawayama Castle in Hikone, is defeated by Tokugawa Ieyasu and later executed in Kyoto. Lord Ii Naomasa, for his meritorious service at the battle of Sekigahara, is rewarded with the fief of Omi (present-day Shiga) and Sawayama Castle. Naomasa, however, did not like the fact that Ishida Mitsunari once occupied the castle, so he decided to build a new castle. 1602 - Lord Ii Naomasa dies mainly due to an old gunshot wound received at Sekigahara. 1603 - Construction of Hikone Castle begins. Structures and materials from nearby castles in Otsu, Nagahama, and Sawayama were also used. 1607 - Construction of Hikone Castle is completed for the most part, and Lord Ii Naokatsu (Naomasa's first son) moves in. 1622 - The final phase of Hikone Castle's construction, including the palace, is completed. 1677 - Genkyuen Garden next to Hikone Castle is completed. 1860 - Lord Ii Naosuke is assassinated in Edo, near Edo Castle's Sakuradamon Gate. 1952 - Hikone Castle is designated as a National Treasure. 1963 - NHK TV broadcasts its first year-long Taiga Drama series called "Hana no Shogai" (花の生涯) from April to Dec. 1963. Based on the period novel of the same name written by Funahashi Seiichi 舟橋 聖一 for Mainichi Newspaper during 1952-53, the story is about the life of Ii Naosuke (1815-60), lord of Hikone Castle and Chief Minister (Tairo 大老) of the Tokugawa government. Naosuke was played by Onoe Shoroku II, a kabuki actor. The series boosts the number of tourists visiting Hikone. Unfortunately, most of the original videotape of the series was erased to reuse the expensive videotape. 1969 - Sister city ties with Ann Arbor, Michigan, USA established. 1989 -The Japan Center for Michigan Universities (JCMU), a study center operated by a consortium of the fifteen public universities in the State of Michigan and the government of Shiga Prefecture opens in a temporary facility in Maibara. In 1990, the permanent campus is completed. 1991 - Sister city ties with Xiangtan, Hunan, China established. 1995 - University of Shiga Prefecture opens in Hassaka. 2007 - Hikone Castle celebrates its 400th anniversary. 2017 - Hikone Castle celebrates its 410th anniversary. Last night (April 11) inside the police koban in front of JR Kawase Station in Hikone, a rookie policeman (19) shot & killed police sergeant Imoto Akira 井本光 (41), a co-worker. He was angered by Imoto's disparagement. He fled the scene in a police car, but was soon caught. For the Tokaido shinkansen, building a shinkansen station in Hikone instead of Maibara was the original plan since Hikone had a larger population. However, due to the higher cost and calls from the Hokuriku region (Fukui, Kanazawa, etc.) wanting a shinkansen connection, the shinkansen station was built at Maibara. Ii Naomasa (井伊直政) (1561-1602 ) - First lord of Hikone from 1600 during the Tokugawa Period. He was a general under Tokugawa Ieyasu whom he helped to win the Battle of Sekigahara in 1600. He was rewarded with Sawayama Castle and the fief of Omi (now Shiga). Instead of occupying Sawayama Castle, home of his former enemy Ishida Mitsunari, he had wished to build a new castle in Hikone. His wish came true years after his death. Ii Naosuke (井伊 直弼) (1815-1860) - Tokugawa shogunate's Chief Minister (Tairo) who favored and concluded commercial treaties with the Western powers and thus broke Japan's isolation from the world. Foreigners were then allowed to trade with Japan and take up residence in cities like Yokohama and Hakodate. Ii was later brutally assassinated in 1860 by people who sought to oust the foreign "barbarians." Ishida Mitsunari 石田 三成 (1560-1600) - Native of Nagahama, and loyal retainer of Toyotomi Hideyoshi. Became lord of Sawayama Castle in Hikone and was later the ill-fated leader of the Western Forces defeated at the Battle of Sekigahara in 1600. Executed by Tokugawa Ieyasu in Kyoto. Other sights in neighboring cities/towns within easy reach from Hikone. Taga Taisha Shrine - Near Taga Taisha-mae Station on the Ohmi Railways. Nagahama - Major city up north. Maibara - Hikone's northern neighbor. This page was last edited on 18 April 2019, at 12:40.